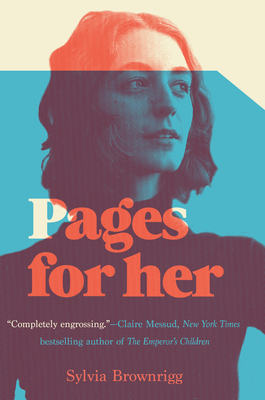 Pages for Her is the story of two women, Flannery and Anne, each at a personal turning point, and the circumstances that lead to their reunion. Twenty years after their brief but passionate affair, chronicled in Sylvia Brownrigg's earlier novel Pages for You, Flannery has the chance once again to meet Anne, who opened young Flannery up to the possibility of love--then left her heartbroken. Having long ago put their love behind them, they live now on opposite coasts. Anne has been in a deep, childless partnership with a fellow scholar, Jasper, who recently left her. Flannery, to her own surprise, married a charismatic artist named Charles, with whom she has a young daughter. Submerged by her husband's demands and personality and her adjustment to motherhood, Flannery has lost sight of herself and her work. When the two women meet at a conference, they find that the passion and understanding between them has endured, though it has been hidden. In rediscovering each other, they are able to rediscover themselves. Pages for Her is an exhilarating, passionate work that explores marriage, sexuality, and the transformative power of love over time. SYLVIA BROWNRIGG is the author of several acclaimed works of fiction: four novels--Morality Tale; The Delivery Room, winner of the Northern California Book Award; Pages for You, winner of a Lambda Award; and The Metaphysical Touch--and a collection of stories, Ten Women Who Shook the World. Her books have been included in the New York Times and Los Angeles Times lists of notable fictions and have been translated into several languages. Her book for children, Kepler's Dream, published under the name Juliet Bell, was recently turned into a feature film. Brownrigg grew up in California and in England, and lives with her family in Berkeley.